Hadrat Ali R.A was the son of Abu Talib, a prominent Quraish chief and custodian of the Holy Ka'bah. Abu Talib was so-called because he was the father of "Talib," the eldest brother of Hadrat Ali. The real name of Abu Talib was 'Abd Manaf.' However, he was more popularly known by his surname than by his real name. Abu Talib was the son of Abdul Muttalib. Abdul Muttalib was also a surname, his real name being Shaybah. Abdul Muttalib was the son of Hashim. Hashim was a great man of his line, and his descendants came to be known as Hashimites. The mother of Hadrat Ali was Fatima. She was the daughter of Asad who was a son of Hashim. Fatima was a cousin of Abu Talib. Thus, both the father and mother of Hadrat Ali were Hashimites, and that was a great honor. holy Prophet was the son of Abdullah who was the son of Abdul Muttalib. Abdullah and Abu Talib were real brothers. Abu Talib was thus the real paternal uncle of the holy Prophet of Islam. Hadrat Ali was the first cousin of the holy Prophet. The holy Prophet and Hadrat Ali had a common grandfather who was Abdul Muttalib. The principal wife of Hadrat Ali was Hadrat Fatima Radiallahu Anha, the favourite daughter of the holy Prophet Muhammad. During the lifetime of Hadrat Fatima, Hadrat Fatima Radiallahu Anha was the mother of three sons and two daughters. The sons were Hasan, Hussain, and Mohsin. Mohsin died during childhood. The daughters were Zainab and Umm Kulsum. * He had the distinction of being a Hashimite both on the side of his father as well as his mother. * He had the distinction of having a name which was derivative of the name of Allah. No other person before him bore the name of Ali. * On opening his eyes after his birth, the first person who he saw was the holy Prophet. * The holy Prophet gave him his name. * As an infant he had the honour of sucking the tongue of the holy Prophet. * He was the first cousin of the holy Prophet. He became a ward of the holy Prophet, and was brought up as a family member of the household of the holy Prophet. * He received his training under the loving care and guidance of the holy Prophet. * When the holy Prophet declared his mission, he was the first teenager to be converted to Islam. * Hadrat Khadijah and Hadrat Ali were the first two persons to pray behind the holy Prophet. * When the holy Prophet invited the Hashimites to a dinner, and aked them to aid him in his mission, Hadrat Ali was the only person to respond to the call of the holy Prophet. * He risked his life for the sake of the holy Prophet and slept on his bed when the holy Prophet left for Medina and the Quraish youth besieged the house with a view to killing the holy Prophet. * When the holy Prophet left for Medina, he entrusted to Hadrat Ali the task of returning the belongings of the people. They had placed their belongings in the custody of the holy Prophet for safekeeping. * When the holy Prophet joined the Muhajirs and the Ansars in fraternity in Medina, he allied himself in fraternity with Hadrat Ali. * The holy Prophet married his beloved daughter Fatima Zahra to Hadrat Ali. * He was commissioned by the holy Prophet to write the agreement which came to be known as the Hudaybia Pact. * After the conquest of Mecca, he had the unique distinction of standing on the shoulders of the holy Prophet and destroying the idols in the Ka'bah. * He was entrusted by the holy Prophet with the special mission of announcing the Quraish Sura "Al Bara'at" (Immunity) to the people on the occasion of the pilgrimage. * When the holy Prophet proposed "Mubahala" [a special kind of debate] with the Christians and the Najran, he chose Hadrat Ali as his "second man." 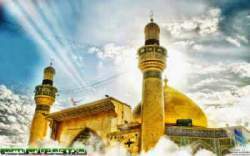 * The progeny of the holy Prophet descends through Hadrat Ali. * He was the only person to whom the holy Prophet imparted "inward knowledge." * The holy Prophet conferred many appellations on Hadrat Ali such as Hidar-iKarrar, Abu Turab, Asad-ullah, Syedul Arab, etc. * The holy Prophet declared his relationship to Hadrat Ali as that of Moses and Aaron. * When the holy Prophet died, Hadrat Ali washed him and prepared his dead body for burial. * He participated in all the wars of early Islam which were fought under the command of the holy Prophet. * In all the battles, Hadrat Ali was the flag-bearer for the forces of the Muslims. * During his lifetime, he killed over 1000 enemies. In the Battle of Badr alone killed two dozen people. * He fought over a hundred duels and in all the duels, his adversaries, however strong, were killed. * He was the conqueror of the Khyber. * He was the most learned man of his age. He was a living encyclopaedia of knowledge and learning. * After the holy Prophet, he was the most eloquent person of the age. * Because of his knowledge and wisdom he is known as the "Second Solomon." * His wise sayings and aphorisms have attained the status of classical proverbs. * He was the first person to write a grammar of the Arabic language. * Among the early Muslims, he was the only person whose collections of writings have come down to us and this collection [is] preserved under the title of Nahj-ul-Balagha. * He was a distinguished poet. * He enjoys fame as the "father of rhetoric." * He was an authority on Mathematics. * He was a master of the science of Physics. * He had a deep medical knowledge. * After the holy Prophet, he is regarded as the greatest philosopher of Islam. * He was a calligrapher and wrote in a beautiful hand. * He was the first person to learn the Qur'an by heart. * He is the first revivalist among the Muslims. He interpreted the doctrines of Islam and systematized them. * He is regarded as the "father of Sufism." All schools of Tasawwuf [authentic Sufism] trace their origin to him. * Fear God and you will have no cause to fear anyone. * The Word of God is the medicine of the heart. * Lead such a life that when you die people will mourn you, and while you are alive they long for your company..
* The most happy is he to whom God has given a good wife. * Do not sell your conscience for anything but heaven. * The disease of the heart is worse than the disease of the body. * To fight against one's desires is the greatest of all fights. * The strongest among you is he who subdues himself. * Wealth and greed are the roots of all evil. * Knowledge enlivens the soul. * The learned lives although he dies. * The sum total of excellence is knowledge. * Desire is one's most inveterate enemy. * He who trusts the world, the world betrays him. * Life consists of two days, one for you one against you. So when it’s for you don’t be proud or reckless, and when it’s against you be patient, for both days are test for you. * The best deed of a great man is to forgive and forget. * Woman is a delicate creature with strong emotions who has been created by the Almighty God to shoulder responsibility for educating society and moving toward perfection. God created woman as symbol of His own beauty and to give solace to her partner and her family. A Brief Inspirational Biography of Hazrat ali. all details about his family tree, birth, name, greatness, physical appearance, wives and children and more.